Variable Incidence, the mechanical process of tilting upwards or downwards the wing (or wings) of an aircraft relative to the fuselage to alter its flight characteristics began less than ten years after the Wright Brother’s first flight. One of its earliest proponents was French aviation pioneer and aircraft designer Paul Schmitt. He was fascinated with the prospect of improving the weight lifting capabilities of aircraft through the use of variable incidence and, in 1913, devised the Aerobus. This amazing aircraft set numerous height, speed, lifting, and endurance records in early 1914 based on the variable angle of incidence of the wings. 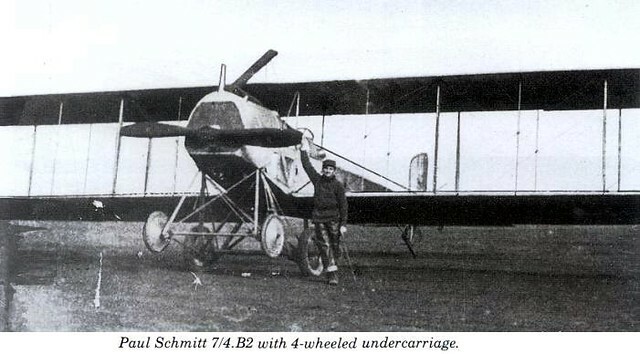 When war came in August 1914, Schmitt volunteered for flying duty and served as a gunner aboard one of his aircraft. Fortunately, French military authorities considered him to be far too valuable to the war effort, and after only a handful of operational flights, he was sent back to designing and building aircraft. Great things were expected of the next generation of Paul Schmitt aircraft based on the Aerobus design with its variable incidence capability. His P.S.3 bomber model entered service in 1915 but only as a trainer. The P.S.4, known initially as the SBR for Schmitt Bomber Renault, served as an interim bomber in limited numbers, as did the P.S. 6. By far, the most successful model was the P.S.7, but by now, due to the constraints of war and the rapidity with which aircraft needed to be built, variable incidence was deleted on his aircraft. 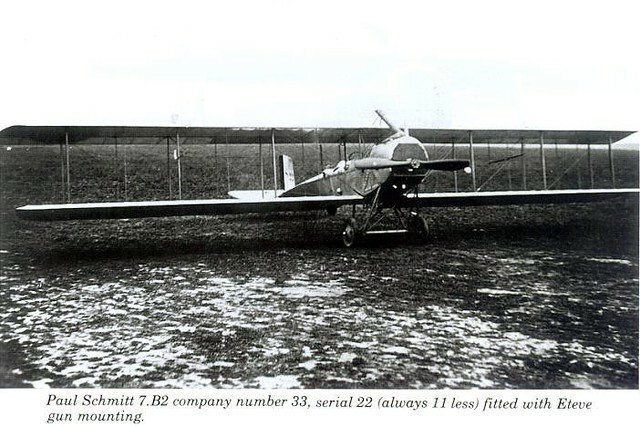 Nonetheless, the Paul Schmitt P.S.7 was a remarkable aircraft for its time, originally engineered to utilize the same principle as Schmitt’s 1913 Aerobus, which had the wing cell able to pivot or alter the angle of incidence to 12 degrees in order to increase lift or speed as required. It was a very large aircraft with long wings that were made of wooden ribs with fabric covering and twelve bays of interplane struts. The fuselage was constructed of metal and covered in aluminum. The wingspan was so large that it caused problems when used on operational missions. The aircraft was difficult to control and could not fly in formation with other machines to give each other mutual defensive support. Added to that was, due to its slow speed, it was highly vulnerable to anti-aircraft fire and attack by enemy fighters. In theory, the P.S.7 was cable of lifting 330 lbs of bombs, an appreciable load for 1915 when the aircraft was designed. 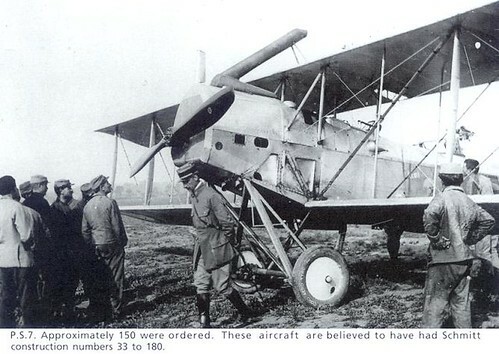 But by the time it reached front line units in April 1917, the bomb load had dropped to barely 200 lbs since two to three machine guns had to be added to protect the woefully slow and unwieldy aircraft. The P.S.7s were initially used for day bombing but met with mixed or disastrous results and soon switched to night bombing. Several machines nosed over on landing in the dark and additional nosewheels had to be added to prevent their destruction. These aircraft were known as P.S.7/4s. 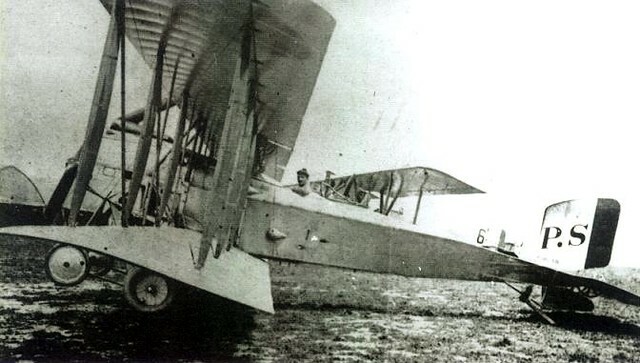 Only four French bomber squadrons were equipped with the aircraft; PS.126, 127, 128 and 129, and by January 1918, all of them had re-equipped with Sopwith 1 ½ Strutters or the outstanding Breguet 14. 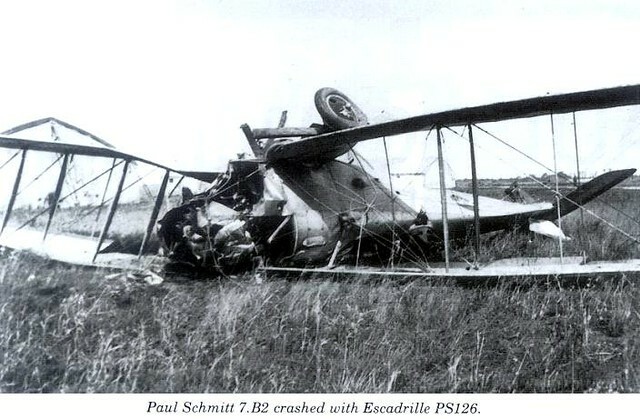 Even had the Paul Schmitt bombers been available in quantity in 1915, it is doubtful they would have had much impact. It was in the realm of civilian aircraft design that Paul Schmitt’s innovations would have most likely made an impression, but the war altered his focus and he spent the next four years attempting to adapt his machines to the requirements of combat, something for which they were ill-suited. Read Gary Warne's Warnepieces blog to rediscover forgotten aircraft! Next week, we'll use other sources to show some of the weirdest WWI bombers. Gets better every day....... Great insight to early bombers. My pleasure, Dan. There's more to come. Yet ANOTHER great article! Really looking forward to the Weirdest WWI Bombers! THANKS!! !